Not many people would turn down a Game of Thrones season 8 cameo, but then again, Game of Thrones creator/all-round ruiner of fictional lives George R.R. Martin is probably one of the few people who can. The author has revealed the reason why it didn’t want to join the likes of Ed Sheeran and, umm, the drummer from Coldplay, in the Mount Rushmore of Thrones cameos – and it’s not because he was worried about being killed off. So, far be it from Martin being scared of the (literal) axe, which would’ve been a fantastically ironic way for the kill-heavy author to go, it was simply a matter of time. In fact, he feels it’s time better spent finishing up The Winds of Winter, the book that will end the Song of Fire and Ice saga that kicked off the worldwide phenomenon. But it’s not as if George R.R. Martin hasn’t had an on-screen cameo before. He has. You’ve just never seen it. As part of the Game of Thrones pilot that never aired (one that didn’t even feature Emilia Clarke or Kit Harington as Dany or Jon Snow, imagine that! ), George R.R. Martin was, as he reveals to EW, “a guest at Dany’s wedding”. Brilliantly, the original George R.R. Martin cameo was killed off, as the entire pilot was scrapped and had to be filmed again. That is what you get for the Red Wedding, Martin. Six weeks left. 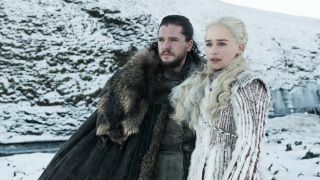 It's time to start swotting up on your Game of Thrones theories and, if you're feeling particularly brave, spying what the cast have to say about the Game of Thrones ending.